“So many people with cancer. I feel so sorry for them.” My husband discards this comment as we climb into the car. I reach out and touch his head where just a few weeks ago – pre-chemo - his hair grew. My heart reaches out to him, this man I love, who so longs to live free of cancer that he can’t even identify with the people who are fighting for health the same way he is. We drive away from the hospital, where in just over a week my husband will be returning for another session of chemotherapy, the 15th in just over a year. As we drive I think how like my husband we all are - how in some way we are all cancer patients who believe that we are not sick - everyone else is. This sickness is in my heart, in my soul and in my tongue. This is the sickness I hide. The belief that everyone else needs Jesus more than me. We keep driving, and I keep thinking about the bible verse in Matthew where Jesus talks to us about a speck of dust. I wonder about how we’re so busy trying to remove that tiny dust particle from our friends’ eye we don’t take a moment to step back and see our vision is blurred by the log in our own eyes. This is an uncomfortable story that Jesus tells. I don’t like to picture a person with a tree growing out their eye anymore than my husband likes to think of himself as a cancer patient or I like to think of myself as a sinner. The truth about our selves often isn’t pretty. And it rarely makes us feel comfortable. When we realize we’re not better than anyone else - that I’m just like you and you’re just like me - we can hand out grace and hope and love like we’re made of the stuff. 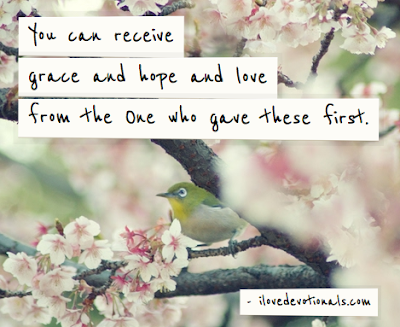 And we can receive grace and hope and love from the One who gave them first. And as we do this healing comes. My husband is a cancer patient. What sickness are you hiding in your life? Ask God to speak truth into your life so you can receive grace and hope and love from Him.